For the first time in India’s mall history, a net negative supply of retail space was observed in 2016 due to closure of some failed malls coupled with limited new supply. While five malls shut down last year, 10 others changed their usage to offices, educational institutes, shopping clusters, hospitals and banquet halls – resulting in ~3.5 mn sft of retail space (across 15 malls across India) getting withdrawn from the operational stock. These malls were operational in Chennai, Delhi-NCR, Mumbai and Pune. It is not the first time that a withdrawal of mall space was done but the quantum this time around was far higher than all previous withdrawals (1Q2010–4Q2015) put together. This is in large part due to the long continuing bipolar dichotomy in the Indian retail sector starting to reach its end. Therefore, a few more malls are expected to meet a similar fate in the next few years. While a handful of good malls continue to perform extremely well across the country, there are many average and poor-quality malls that have been seen floundering over the years, more so in the recent years as both mall designs and shopper expectations evolve. Shopping in a mall is much more of an experience now. With India positioning itself higher on the global retail ladder, neither retailers nor shoppers want to visit an average or poor mall. Moreover, a mall’s success is far more dependent on maintaining the best possible tenant mix and having at least a few tenants from the entertainment and food and beverage (F&B) categories. 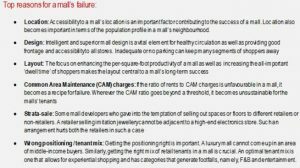 It has been seen in recent years that retailers choose high-quality malls having mixed-use at the right locations. Many smaller-sized malls and those lacking tenants in the F&B as well as entertainment categories are finding it difficult to sustain, something which is going to become tougher with time. Last year, the total net absorption of retail space in India was 2.7 million sq ft with Delhi-NCR recording an absorption of 1 mn sft followed by Mumbai at 0.6 mn sft and Bangalore at 0.4 mn sft. While 13 malls got completed in 2016, 15 malls were withdrawn from the operational stock, resulting in a net effect of -0.3 million sft reflecting on the supply side. Apart from aforementioned reasons, withdrawals also include instances of malls that no longer meet the Grade-A criteria. Despite these withdrawals, the Indian retail story still remains intact. 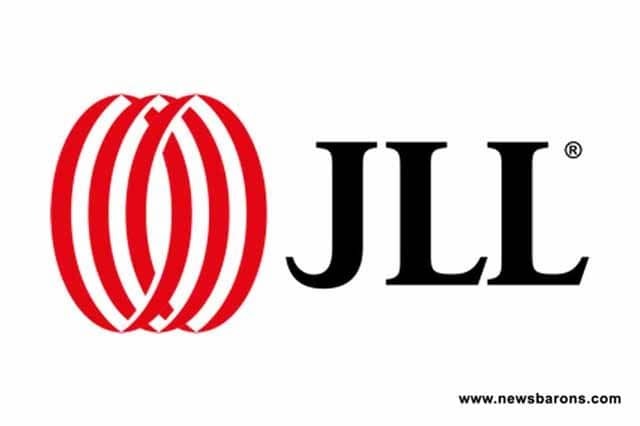 It is also pertinent to note that in the past few quarters, a newfound interest of private equity investors towards the Indian retail real estate sector has been seen. Moreover, 2017 appears to be a strong year, with over 9.1 mn sft of supply expected to come in. 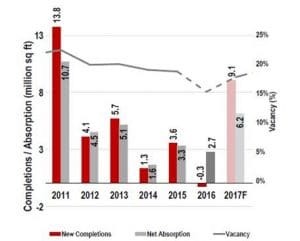 Completions expected to be ready by end of this year have highly-skewed pre-commitment levels. 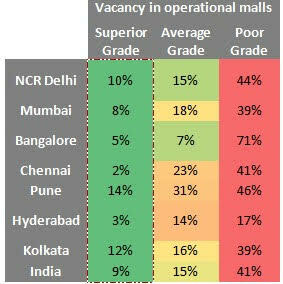 As is the case always, good malls are witnessing moderate-to-good pre-commitment levels ranging from 51-75% whereas the not-so-good completions are seeing poor pre-commitments of 0-50%. With large spaces signed up by anchor retailers and large-format stores in the upcoming quality supply of 2017, these malls are expected to be completed on schedule.